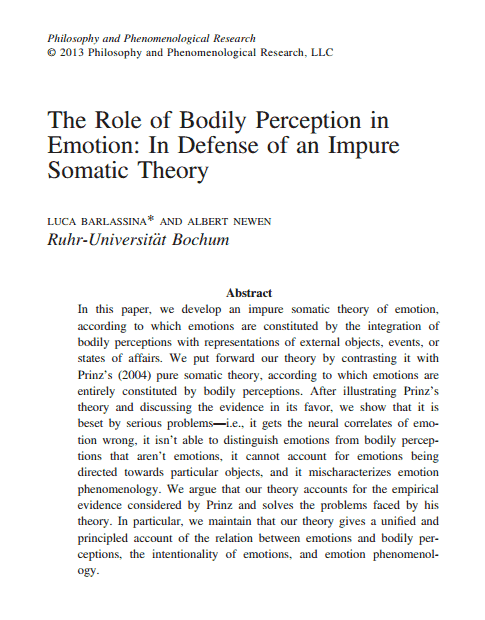 In this paper, we develop an impure somatic theory of emotion, according to which emotions are constituted by the integration of bodily perceptions with representations of external objects, events, or states of affairs. We put forward our theory by contrasting it with Prinz’s (2004) pure somatic theory, according to which emotions are entirely constituted by bodily perceptions. After illustrating Prinz’s theory and discussing the evidence in its favor, we show that it is beset by serious problems—i.e., it gets the neural correlates of emotion wrong, it isn’t able to distinguish emotions from bodily perceptions that aren’t emotions, it cannot account for emotions being directed towards particular objects, and it mischaracterizes emotion phenomenology. We argue that our theory accounts for the empirical evidence considered by Prinz and solves the problems faced by his theory. In particular, we maintain that our theory gives a uniﬁed and principled account of the relation between emotions and bodily perceptions, the intentionality of emotions, and emotion phenomenology.